all the thank you notes! Just wanted to share a few. For those of us Phightin’ to be gluten-free, the food we eat determines how healthy our season will be. When it came to our wedding menu, my husband and I made no exception. Criteria: Kosher, gluten-free and lactose-free menu that incorporates our favorite foods and fresh ingredients. Vision: Beautiful presentation, delicious flavor and variety that is reflective of us and our enjoyment of healthy, delectable dishes. Experience: Romantic, festive, memorable and a gourmet gluten-free culinary experience for our friends and family. Our lineup for the big day included Jannette Axlerod of Food Designs and her chefs. They had prior experience safely cooking gluten-free for affairs and were a great addition to our Fraimow-Bronstein all-star team. Practices were rigorous with menu tastings, ingredient changes and creative food pairings. Outcome: Grand slam! With the support of our strong, loving management team, we pulled-off a perfect win. Our playbook now includes new dishes that we can replicate for healthy, fun times ahead. Read below for a taste of our wedding bliss and ideas for your next party. Thank you for a wonderful three day extravaganza of food. Everything arrived promptly, looked wonderful and tasted delicious. Portions were generous and everyone was so pleased: vegans, vegetarians, kosher eaters, and folks like me. You thought of everything to make my job easy. I'm really flattered by all the thanks I'm getting, but it really belongs to you and your staff. I don't think there is a doubt that someone will be contacting you next year for Limmud 2012. There's talk of a new venue that will accommodate storage so everyone's job will be easier. Let's hope so. Thank you so much for the fabulous food, beautiful presentation, and wonderful catering staff. The Shabbat luncheon in celebration of Ariel's Bar Mitzvah was delicious & memorable. It was a pleasure to work with you & we look forward to our next simcha on October 31! So many people wanted to know, "Who was the caterer?" because everything looked and tasted so good! We will continue to recommend you to all of our congregants. Many thanks for making our event so beautiful and special. I can't say I saw all that you did, but my guests have told me how pleased they were with your food and presentations. So many thanks for being so accommodating! I'd like to thank you for providing a wonderful meal on Friday. We all enjoyed it very much. Please pass along our compliments to the chefs. I really appreciate the flowers you sent - they made a lovely centerpiece for the dinner table. The food was delicious--you got rave reviews. Thanks for everything--including the last minute wine exchange! Thank you so much for the wonderful job you did on the Kiddush luncheon for our son’s Bar Mitzvah at TBI this past Shabbat. It was absolutely perfect. You did a great job of matching the décor to the paper plates I gave you – nothing like a last minute challenge to keep things exciting! At the luncheon, the food was plentiful, delicious and presented beautifully. We received many compliments and wanted you to know that we truly appreciated the fantastic job that you did. It was also a pleasure to work with you. You were always responsive and your advice was invaluable to us as we planned our luncheon. We had a wonderful party and I have not stopped getting calls, e mails and Facebook posts about the food. I keep hearing “the food was better than ever.” I don’t necessarily agree since it is always outstanding! There is always such a variety and so much more than expected. Debbie, Jeff and Albert are the consummate professionals. Thank you so much for continually working with us. We are a small synagogue and whatever extra money we can raise is needed. Wishing you a happy, healthy and prosperous New Year. Everything was amazing! Thank you so much! The food was delicious. So many people told me how delicious everything, the hor d'oevers and the meal, were. And everything was beautiful - from the bouquets to the chuppah and the tables. I also heard comments how attentive the staff was. See you at my next simcha! Once again thank you for a wonderful party. As I mentioned, our guests continued to rave about the appetizers. You are a classy organization and feel free to use us as reference whenever you want. I just wanted to say that tonight's dinner was absolutely delicious! The salad and soup bars were a real hit....everybody was raving about them. Dinner was exceptional. The room looked beautiful and your staff were incredibly professional, accommodating and nice. Thank you for making our Hanukkah dinner a memorable night. Compliments to you and the catering staff on the sandwiches and couscous you prepared for the Sisterhood Bingo at Ohev Shalom of Bucks County. Everything was delicious and the presentation was beautifully done. Many positive comments were made about the food. We know that we can count on you to help our Sisterhood events "shine". Thank you for your hard work. We had many compliments from guests at Marissa's luncheon. The decor was beautiful and in keeping with her theme, thanks for working in our decorations we provided. The food was delicious. The chicken was a hit. Sorry we won't have another B. Mitzvah, but we hopefully will have 2 weddings in 10-20 years. It was nice meeting you yesterday and putting a face to the name and voice. The food was delicious, the presentation lovely, and the staff was gracious and attentive. Everyone was very pleased. I will certainly tell everyone I know about you. Everything was really great. Thank you as always. A number of people asked me who was catering - the food and displays were all great. And your staff was 110% great as always. Jannette, just one more thank you and your staff for helping to make Jack's retirement party a big success. 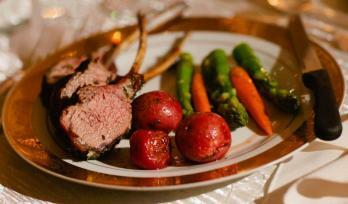 As I'd mentioned, I received lots of compliments on the food, a key element in party planning. Guest especially liked the tuna. And your staff was friendly and accommodating as well. I hope we can join up again some time in the future to plan a happy occasion. Thanks so much for the beautiful dessert tray on Hanukkah. We wish you a happy and healthy New Year! I honestly believe the food at Jason's Bar Mitzvah was the best I've ever had. I wanted to let you know that the meal last week received rave reviews. Mack and the rest of the staff rose to the occasion to deal with logistic challenges presented by Hillel and I appreciated their ‘can do’ attitude. Hi Janette, I've been wanting to thank you for a beautiful luncheon!! The food, presentation and service were all great! Thank you so much. Have a wonderful holiday and happy New Year! Food Designs will be my first phone call as the holidays approach! Thanks very much for the wonderful dinner last Thursday night at Temple Beth Hillel-Beth El. The chicken was absolutely wonderful and all of the women enjoyed it very much. The side dishes and salad were wonderful as well! Jannette, Thanks for the sandwiches. You helped make a great Bingo for us. We will send the bill to our Sisterhood treasurer for payment. YOU ARE THE BEST!! Thanks for making our entire weekend so great!!! Rockin' the Planet Since 1961! Thanks for the wonderful weekend. You were a pleasure to work with. The food was absolutely terrific. We were delighted with each meal, with the attentive staff, with the beautiful tablecloths and dried flower arrangements (which I didn't know you would be providing). Thanks for making it such a memorable time. I look forward to working with you again. 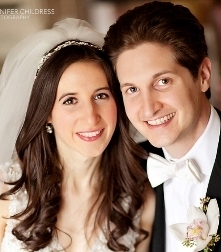 We are still raving about the food and service you provided us on our wedding day, February 14th, at Har Zion Temple. Once again, and as everyone said when they referred you to us, you did not disappoint. My mother is so in love with our sweet kugel and blintzes that she wants to know if she can order these items from you. We cannot thank you enough for everything. The party was AMAAAAAAAAAAAAAAZING and people are still ranting and raving about the food. I (Karen) had the salmon for dinner last night and brought some more to work today for lunch. I couldn't stay away from the BBQ beef all day yesterday and Dean can't believe how good pastrami-wrapped pineapple is. He says when he thinks of the two things together, he can't imagine it tasting good, but he's addicted! One of my coworkers says she was eating all the extras her tablemates didn't want or were too full to eat. The service was impeccable, the decor was perfect and we're glad we added the balloons . . . it wouldn't have been the same without them. The room above four feet would have been empty. Dean wants to give special kudos to the waiter who handled our table. Every time he saw Dean needed a refill, he was right there. Dean also has been ranting and raving about the bartender . . . very polite, accommodating, friendly all around, but always made sure we and everyone at our table were especially taken care of. Thank you for everything!! It was perfect!! So happy with the entire night!! Compliments on the food, really appreciate all your hard work in dealing with me this time around. 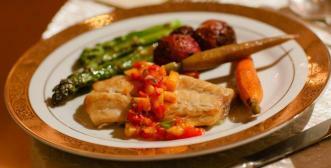 I have catered many family s'machot and have always worked with a caterer well known to me or highly recommended. This was the first time I had worked with a caterer sight unseen or untasted. I want to thank you for adding so much to my grandson's brit milah and for being so accommodating to our needs on Thanksgiving Day. The food was delicious, Grace and Oscar, our servers were wonderful and so helpful and your personal touches meant so much to all of us. The blue table cloths matched the table decorations perfectly and the flowers were exquisite. Thank your for filling in those important elements that, in the excitement of the birth, I missed! The football watchers loved having the extra veggies in the afternoon and the extra fruit was a perfect complement to our Thanksgiving desserts. Two other items are worth mentioning. There were many compliments for the blueberry covered goat cheese - my personal favorite and the brownies are delicious at room temperature or frozen! Again, thank you for helping us out on short notice with such professionalism and hamishness. Jannette, I hope you will take advantage of me and use it as an endorsement of your services. It was a pleasure. I am going to try the goat cheese/blueberry log. I wanted to take a moment and let all of you know how great Saturday was and how much we appreciate all of the help and effort that was made to make that day so successful and fulfilling for our family. It will be memorable forever. Thanks again! I wanted to send out an overwhelmingly heartfelt THANK YOU to all of the vendors who helped to make Rachel & Stuart’s wedding the wonderful day it was. Your dedication to your work and attention to detail helped take our mind off all the extra details and concentrate on our family and friends and the beautiful weekend we planned. From the Kiddush to the wedding cake, no detail was overlooked. We’re sorry this letter comes to you so late, but we wanted to let you know how much we really appreciated all your help the afternoon/evening of Jacob's Bar Mitzvah on October 29, 2011. It was such a crazy day, and we know the horrible weather attributed to the delay in the schedule. As usual, you were patient and willing to work with us during the weeks prior to our event. Your suggestion for the different colored napkins for each table really made the tables pop with color. The hors d’oeuvers were beautifully presented and were very tasty. Your wait staff was wonderful and we were so happy that you were able to get the water ice and cotton candy machine from our fellow congregant. We were very grateful that you were able help us at the last minute with the bar drinks and mixers and you were able to accommodate our desire to have basketball cupcakes instead of a cake. When everything finally came to an end, we received many compliments on the food’s presentation and how delicious it was. We are very appreciative of the great job you did and look forward to working with you again in the future. Thank you for a stupendous job all the way around! Everything was perfect! I had to let you know that Brandi, our emcee for the Nordlinger event at Beth Sholom, said your person running the room that evening was FANTASTIC! She said he was exceptional to work with – and I wanted to pass that on. Please continue to recommend us – DJs and Bands -- and we will do the same for you, for sure! Just wanted you to know that there will be no problem with the check that I wrote you. Thank you for your beautiful work on my father's party. The food was exceptionally delicious, everything from the latkes to the cake was wonderful. Loved the salmon and the couscous. My guests raved about it. I had a conversation about the perfection of the asparagus with one of my vegetarian cousins! Thank you for going to the trouble of trying a new recipe for my party. The mujadarra was delicious. I was disappointed that my gluten-free, dairy-free, sugar-free kosher vegetarian cousin couldn't eat it, but he certainly did not go hungry. I tried. Thank you and your rabbi for permitting the champagne to be served. We really appreciated that. The family and my father's friends look forward to my Aunt Rose's hamantaschen every year, and as long as they could take some home, she was happy. She makes a special batch for one of my cousins who is allergic to nuts. Your staff was wonderful, and I did not get a chance to properly thank them. Can you pass along the e-mail addresses of your chef and maitre'd? Thank you for your help with the timing. I am not very good at stage managing these events, and I appreciated you staying. Had I known you were going to stay as long as you did, I would have put you on the list for parking. I was so pre-occupied with my guests who were late or got lost. Who knew there was going to be a parade ? Have a happy, busy spring season! I cannot thank you and your staff enough for everything on Saturday - the food was amazing and your staff was incredible. The Browns are wonderful and so sweet. We really appreciate everything so much. Looking forward to working with you for Rebecca's - which will not be in December! Just wanted you to know that everything went very well on Saturday. The food was delicious and the cake was amazing. Thanks again for all your help. I hope to have a need for your "catering" again sometime in the future. Again, I want to thank you for all the hard work. Jeff did a GREAT job on the appetizers! Actually, MAGNIFICENT might be a better word. They were very impressive and generous. Probably the best I have ever had and as I told you I was raised in the food business and am quite critical. Thanks again, also for the decorations around the appetizer table. I wanted to write to thank you for the Kiddush on Saturday, 8/29. It was beautiful (the set up looked great! ), the two servers could not have been nicer, and the food, of course, was terrific! Thank you for making it so easy to deal with you, and your company! Looking forward to the Sisterhood Membership Dinner in October with you! You are too gracious! We are indebted to you, and thank you again for helping to make our simcha joyous and delicious. We wish you and your husband a wonderful summer, and better health days ahead. On behalf of the Beth Zion Beth Israel Sisterhood, I thank you for the superb dinner you provided for us last night. The salad was, in my opinion, the best I have ever eaten. The fish was perfectly cooked. You had expressed hesitation regarding serving the fish at room temperature. Rest assured, it was wonderful! Every item was just right. Margot's party was spectacular. The food was terrific. Your staff was amazing. We really appreciate everything... the night was better than we imagined. Thanks so much for everything. Hope to see you soon. I just wanted to thank you for a lovely evening-- the food was excellent ..!! Thank you for your beautiful work on my father's party. The food was exceptionally delicious, everything from the latkes to the cake was wonderful. We loved the salmon and the couscous. My guests raved about it. I had a conversation about the perfection of the asparagus with one of my vegetarian cousins! Your staff was wonderful, and I did not get a chance to properly thank them. Can you pass along the e-mail addresses of your chef and maître’d? Thank you for your help with the timing. I am not very good at stage managing these events, and I appreciated you staying. Had I known you were going to stay as long as you did, I would have put you on the list for parking. I was so pre-occupied with my guests who were late or got lost. Who knew there was going to be a parade? The party was better then we ever could have expected or planned for, jeff is amazing! Thanks for all of your help, i hope to have gotten you some new business, all of my guests were raving about the food.